Parents gathered at Merstone School to air their concerns over the safety of their children walking to and from school, using the main entrance. 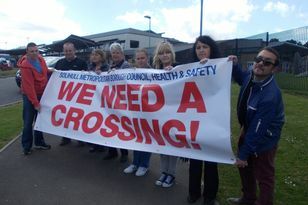 Parents are calling for a crossing outside Merstone special school in Smith's Wood. Furious parents of children attending a special school in Smith’s Wood are demanding answers from Solihull Council after plans from a year ago to build a crossing to improve safety have still not been delivered. Joanne Smith, whose 13-year-old son Chad attends the special school, said she has been campaigning for three years to have a crossing installed at the entrance of the school, on Windward Way. A petition was also handed to the council last year, with the local authority recommending a zebra crossing should be built. “I have been fighting this now for three years,” 42-year-old Ms Smith said. “Now the council is telling us there is no funding available. “My son wants to know why he can’t walk to school on his own like his other friends. But while the road is this dangerous and without any safety crossing, I cannot allow him to. “This school is all about promoting independence and the children, who are vulnerable, are not being able to carry this out. Child minder Elizabeth Taylor, who takes a seven-year-old into the school every day, echoed the concerns. “It’s so difficult at home time. It gets so busy and you’re trying to negotiate the traffic, as well as trying to keep hold of a seven-year-old,” she added. “The cars just don’t stop. There needs to be a crossing in place. We are not asking for the world – even a lollipop man would be something.” Councillors Mark Wilson (Green, Smith’s Wood) and Chris Williams (Green, Chelmsley Wood) are also backing calls for the crossing. A Solihull Council spokesman said: “Last year, the Council conducted a pedestrian assessment on Windward Way which recommended a zebra crossing should be built. However, the Council’s available resources are currently committed to an established three-year programme of highways work until 2016/17.